In my networking career I haven’t had a chance to work with IPv6 much. But recently I was asked to help with IPv6 related issue and while working on it, I wasn’t able to find any easy to follow guides (or the ones that I have found weren’t working for me). I am hoping that this post will provide a simple and easy to follow guide to create working NAT64 environment for testing purposes, as well as give some NAT64 information. I work for a SaaS company and recently we contracted a third-party company to write Android and iOS apps for one of our services. Android app got approved by the play store quickly, but the iOS one was not passing their tests. Specifically, it was failing with the “server can’t be reached” error. Upon talking to Apple support, we were informed that their test network is IPv6-only network that is utilizing NAT64 in order to communicate to IPv4-only sites (which is our case). The third party developer claimed that they did Apple-recommended tests with turning Mac into Nat64 gateway and also did tests on T-Mobile network (which is IPv6-only), but couldn’t recreate the issue. That’s when I was contacted and asked to see whether I can help recreate the issue and figure out what was causing it. NAT64 is a mechanism for allowing IPv6-only hosts communicate with IPv4-only hosts. In this particular example, I am looking to allow communication from IPv6-only iPhone to IPv4-only web server. There are 2 parts required for the NAT64 translation – DNS64 server and actual NAT64 translation. IPv6 only host does DNS query against a DNS64 server. If the public record has AAAA record, then the server simply responds with it and communication proceeds as a normal IPv6 communication would. However, if there’s no AAAA record, then the DNS64 server synthesizes one from the IPv4 address in the specified /96 subnet (it can be larger than /96, but can’t be smaller as it needs 32 bits to describe IPv4 address; space 64:ff9b::/96 is allocated for this specific purpose) and responds with that address as AAAA record. IPv6 host then starts communication to this synthesized IP address, which is then routed to the system (router, host) that does NAT64 translation. The NAT64 then decodes the IPv4 address from the original IPv6 destination address and sends out the IPv4 packet to the destination server. When the NAT64 system receives reponse from the IPv4 server, it puts IPv6 headers back on it and sends it to the original requester. There are 2 ways of implementing NAT64: stateful and stateless. The former one keeps states of all the connections, allowing you to use one IPv4 address to translate multiple IPv6 requests (similar to PAT), while the latter one requires one IPv4 address per IPv6 host (similar to dynamic 1:1 NAT). In this particular example I am using Tayga implementation of NAT64, which is stateless. As IPv6 is not enabled in my network at work, I had to use my home internet connection that does have IPv6 connectivity. Also, as the end goal was to test the application on the iPhone, I had to make sure that all the configuration is done dynamically, as you can’t set static IPv6 addresses on the phone. For my internet connectivity I am using Mikrotik router. It receives IPv4 and IPv6 via DHCP from the ISP. It acts as DHCP server for internet IPv4 addresses, but I couldn’t get DHCPv6 working on it, so I am just using stateless IPv6 configuration that is more than sufficient for home use. For the NAT64 translation I am using CentOS7 Linux VM, which also acts as a DNS64 server using Bind. As initially I wasn’t aware of the 64:ff9b::/96 address allocated for the NAT64 usage, I have used some arbitrary range of 2602:18c:101:4789:1::/96 for my setup. I will keep referencing this range, even though you probably would want to use the dedicated one. 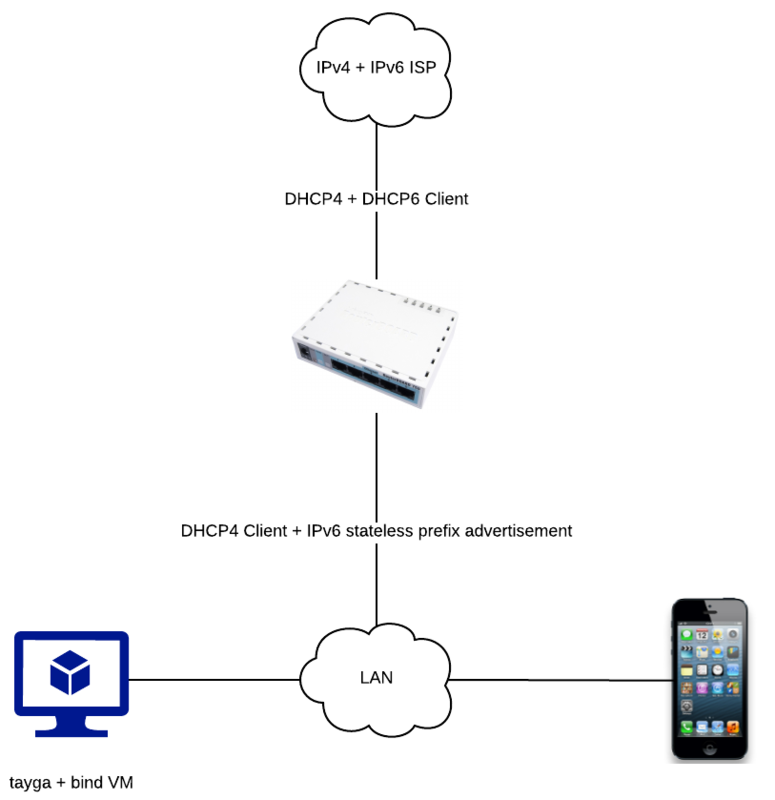 One of the challenges I had with this setup was lack of DHCPv6 server, which made it impossible to provide necessary IPv6 DNS server information to the phone. As a workaround I had to use DHCPv4 for that. I did change the settings of the DHCPv4 scope to not include default gateway, so systems had no way of accessing the internet over it. For this setup I have been using a minimal install of CentOS, running of ESXi host, but any Linux VM would do. You would want to set up static IPs if you plan to use your setup for a while, but for quick testing you just need to make sure you have static DNS set up. After that you are ready to install things. Make sure that Bind responds to DNS queries and returns AAAA record for hosts that don’t have one and that AAAA has IP address from the range that you have configured. When you start tayga in debug mode, it lists the IPs that it assigned to the tunneled interface. Make sure that you can ping both IPv4 and IPv6 addresses from another host on your network. This very basic setup allowed me to recreate the issue Apple Store was seeing and ultimately led to an update to the app that fixed the issue. It is by no means a production grade, but it does work and for most of the common internet usage you won’t notice any issues. I did find that some applications that use less common or proprietary protocols (for example, online video games) don’t work with this setup at all, so I am not sure that NAT64 (or at least this implementation of NAT64) is a valid method for internet access beyond common web-browsing and simple applications using common protocols. We’re also having with Apple rejecting an iOS app based on IPv6 compatibility, despite the app working fine wit the Mac nat64 test setup. Do you mind sharing more specifically what your app’s issue was or how you found it with your Tayga setup? I can share what I know, however keep in mind that I have not been in direct contact with Apple (so some details may have been lost), and also 3rd-party developer could have easily not disclosed the reason for real issue. After recreating the failure scenario with my phone, I did packet captures with both IPv4 and IPv6 networks. I did IPv4 captires on my router and IP6 captures on the NAT64 VM (looking back that was a mistake, I should have done captures in both places). Keep in mind, I had no access to the code or any architecture of the application, so I had to pretty much reverse engineer it. The IPv4 communication flow for that build if the app was: 1) app reaches to the 3rd-party site, 2) app reaches out to our authentication service, 3) app continues communicating with the 3rd-party site. With IPv6 though, the flow was: 1) app reaches to the 3-rd party site, 2) app reaches to our authentication service, 3) crickets. Meaning after that NOTHING was going on at all, app didn’t even try to make any request to continue communications. The last packets seen were DNS queries to another 3-rd party site and unlike the one in step #1, this one had real AAAA record. I have noticed that only much later, otherwise we would be able to find the issue much sooner. With this info we got back to the app developers and after some time they have a) noticed that they have AAAA records for their load-balancers while those load-balancers are not listening on IPv6, b) they have upgraded some library in the application per recommendation of Apple. The app worked after that. So I believe the main reason in our case was the AAAA record for the service that wasn’t litening to IPv6 (I believe they mentioned they were in AWS, so maybe they have pointed site to the dualstack ELB DNS record without allowing IPv6? Just a guess). Any dual-stack host would try to connect to it via IPv6 and then fail back to IPv4, but with NAT64 there’s no such fallback available. Another thing that they mentioned, was that you could request Apple to test with T-Mobile. Supposedly they would be happy if they could confirm it worked from it, but I wouldn’t know how that worked. Plus, this test does show something is iffy with your setup and you may want to fix it now, rather than later. Thanks for the brief description. I want to test tayga and if it works well I want to deploy it for our fixed broadband network. I have both IPv4 and V6 peering with many upstream provider also with many public IPv4 and IPv6 link global address. For testing in my LAB I am using ubuntu 16.4 as NAT translator and cisco as a core router. I just want to know if the requested site has IPv4 and V6 hosting then the traffic from client goes as normal IPv6 traffic. In your diagram there is no IPv6 connectivity from Mikrotik to Tyaga VM. Then how only IPv6 traffic go to the internet through Mikrotik? After creating the NAT64 interface is it needed to configure any default route through the “dev”[physical interface] interface. If you need any topology I can send you anytime. I am very much interested to test tayga so please help me to do this. 1) I am not sure if tayga is production-ready. But it’s up to you of course. 2) If the endpoint has AAAA record, then the IPv6 client will attempt to access that endpoint directly, thus Tayga will never see that traffic. That’s why it has no need for IPv6 IP address. http://www.yahoo.com. 1522 IN CNAME atsv2-fp.wg1.b.yahoo.com. http://www.yahoo.com. 1509 IN CNAME atsv2-fp.wg1.b.yahoo.com.